Traditionally, artists plan out the image and color selection of a relief reduction print ahead of time before the printing process even begins. I occasionally take this route, as seen in "Inspiration for Change", a 5 color reduction linocut print with chine colle. My sketch with color before the printing process. However, I don't always apply this method, as I really enjoy carving into a fresh sheet of linoleum, making marks and lines as my mind thinks to make them. In that case, another approach I use is to print one layer of "carving doodles" and then begin to plan bold markings using brushstrokes and screen prints. This slideshow shows the process I took to create Language of Signals after printing a series of carving doodles. My first layer has been printed, and now I am planning layer 2 using marks and lines from my silkscreen transparencies. When planning, I have to remember the final image will be backwards. I silkscreen printed my images on to the linoleum. The color didn't matter because I planned to carve out those marks. A view of my work station as I mix colors attempting to get some variation in color in each of my layers. Layer 2 has been printed on top of the first layer in greens and teals. The next one you will see has a pink and purple 2nd layer. Here I am planning my 3rd layer to carve out. I dripped india ink directly onto the linoleum to carve out, and the rest of the marks were silkscreen printed on to the linoleum for consistency. I decided I liked this mark better for the piece. The transparencies really allow me to view many options and explore combinations before continuing the process. 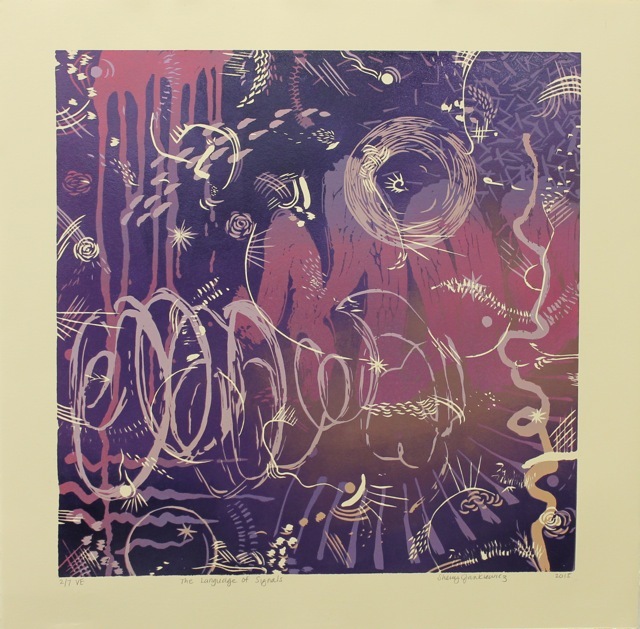 This is one of the finished prints with the previous marks carved out. 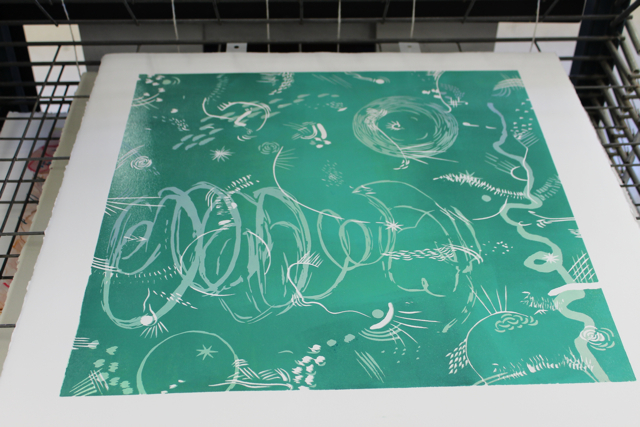 Here is the green and teal print with the 3rd layer printed to finish the image. 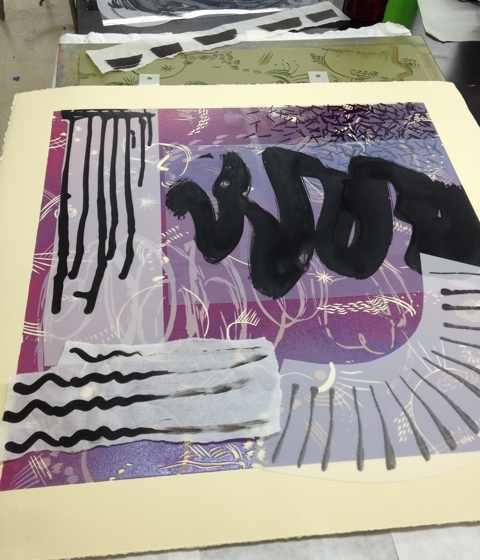 Chine Colle is a process in printmaking that involves adhering other papers into an image during the printing process. 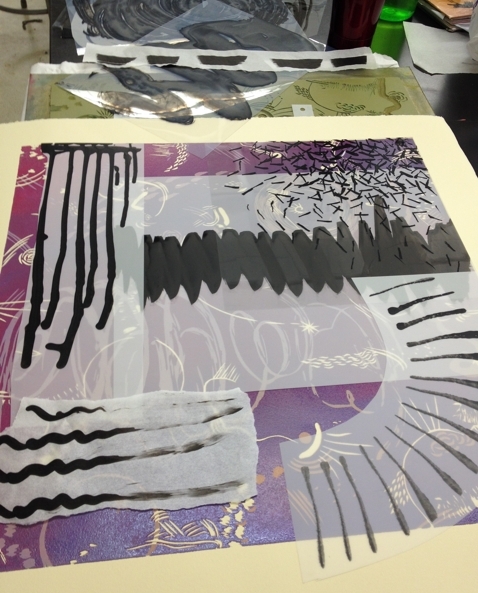 A collage of prints would be cutting and pasting prints together in a separate step of the art making process, where as chine colle papers are applied after the plate is inked, but before the printing paper is placed on top of the plate. Check out the following slide show to help demonstrate this! cut out the area you would like to be a different color. Here I am applying chine colle into the last layer of a reduction print. The patterned side is actually the BACK of my chine colle. I flipped both papers to the back to do this. This is where they will be placed within my print. I like to try to create color transitions within my layers. Garden gloves are great for handling this messy part as they slip on and off easily! Apply adhesive to the paper. Make sure you are adding adhesive to the right side of the paper (the back). I use YES glue, but I have also used spray mount, and Rhoplex Adhesives. place the paper on the right spot- glue side UP! Make sure it does not move around. Then, lay the printing paper on top. Hand print or send it through the press! At times, using a slightly tighter pressure is helpful. Waiting to see the end result! 3 Color Reduction Print with Chine Colle.